"And now for something completely different….."
This week we are doing something completely different. 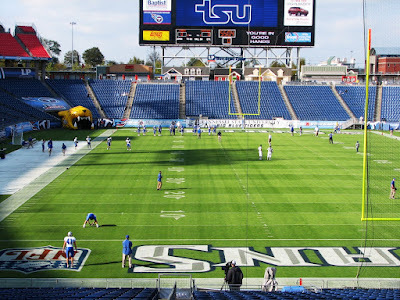 Ken is writing the blog, baby and the furkids are staying home, and we are driving the Audi to Nashville for the Tennessee State game. Whoa that is different! Baby in her space all by herself. Baby has been bad. She has been wearing me out on longer trips. My limit for driving baby seems to be in the five to six hour range. She likes to move side to side with any distraction, whether it is a passing truck, a gust of wind, or a roll in the road. I have done some research and she will get some corrective therapy next week. Since we will be staying at campground Fairfield and campground Drury Inn we also had to leave Sox and Ditka behind. 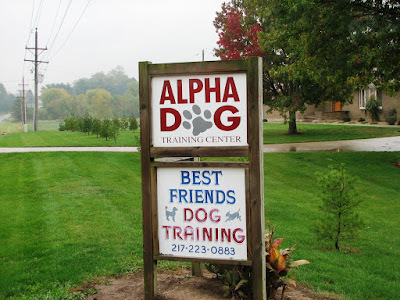 The sign welcoming Sox and Ditka to their weekend home. We had planned to leave early Saturday morning as the game was set to start at six. However, just a couple of days before the game we got word that they had moved the game time to four o’clock. 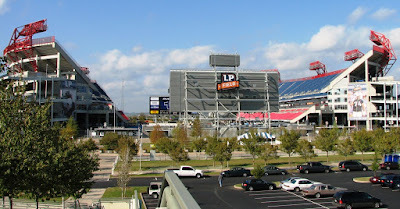 They did this to accommodate the NFL since we were playing on the Tennessee Titans field and they were hosting the Oakland Raiders the next day. We changed our plans and left Friday after Cindy got off work driving to campground Fairfield in Mt. Vernon IL. There we stayed in site 208 which was a well shaded space with a king bed and an exhaust fan in the bath. I mention the exhaust fan because of my sour stomach. It made our stay much more pleasant. We slept well and were off in good time in the morning. While parking at campground Drury Inn, the Sobel’s drove in. They are the parents of Jeff Sobel one of Trevor’s team mates and all around good guy. We claimed our campsites and after a short breather headed off to the stadium. The field was beautiful and real grass for once! This game was the second annual Biker’s Classic. 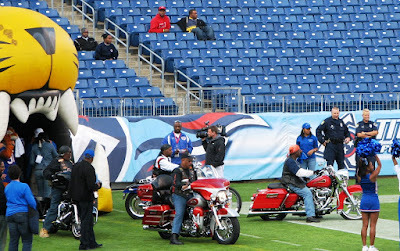 There was a bike show prior to the game with awards given during halftime for the best in show bikes in the various categories. 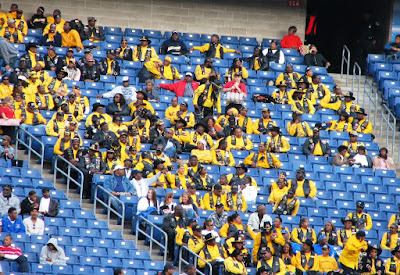 Also the National Association of Buffalo Soldiers Motorcycle Club donated $15,000.00 to Tennesse State. It was an exciting game, yet typical of how we’ve been playing lately. During most of the games this year we have been turning the ball over in the first half and letting the other teams either stay close or take a half time lead and we did it again this game. 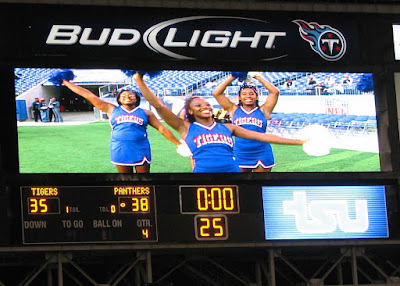 We won on a game ending field goal so we were able to leave the game happy. 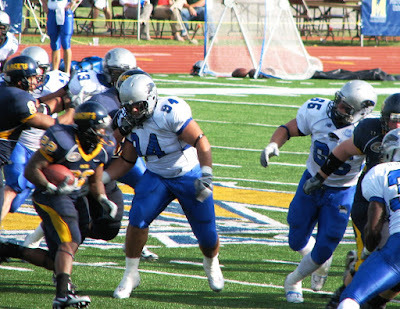 Trevor pushing his way through the O-line. After visiting with Trevor and the other players we had planned to go out to eat with the Sobel’s. However, it was Cindy’s turn to feel bad. She was nauseous and in no shape to go out. So we stopped for a quick bite on the way back to our campsite before wrapping Cindy in blankets and tucking her in. Within 5 minutes of laying down she was asleep. Since we were in bed early it was no problem to get up early. We happened to meet the Sobel’s during breakfast which was very pleasant as we enjoy their company. As we left the hotel we drove along the interstate with several Raider fans and then past the stadium where people were already filling the parking lot to start tailgating. 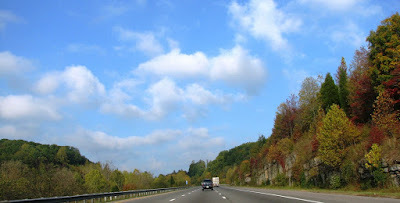 It was a nice drive Sunday morning. Traffic was relatively light and moving between 75 and 80 mph. and we were getting 35 mpg. Then it was my turn. I started to get what Cindy had. It was still a beautiful day and we made good time. We were able to stop in St Louis for a late lunch, and still get back in time to pick up Sox and Ditka before the kennals 6:30 close. 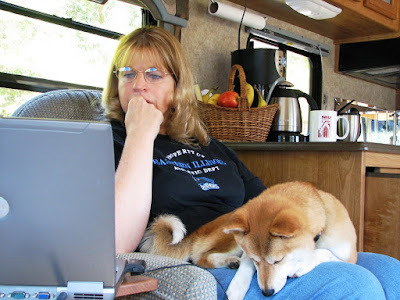 After settling in for the evening Cindy got on the computer to see what was happing on the RV Dreams web site. She learned that we had just missed two other couples that she wanted to meet and that one of them had their sons at the game. It is a small world. That was a completely different kind of weekend! 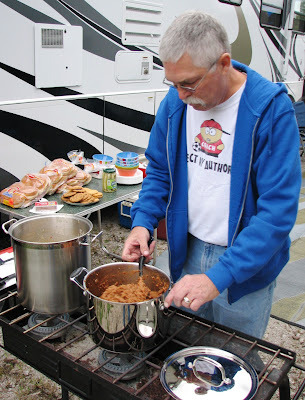 Ken cooked up a big batch of sloppy joes and Italian sausage soup for the boys before we left Quincy. We arrived at Trevor's house late afternoon on Friday, set up the RV and then began warming up the sandwiches, soup and nachos for the boys. The guys began showing up after practice. We found out that, unfortunately, neither Don Thomas (far right) above or Drew Cairo-Gross (center below) would be on the field this weekend because of injuries. 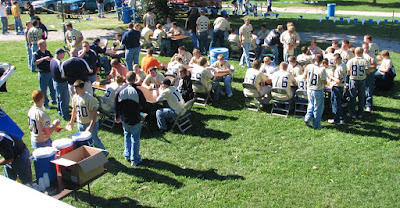 We fed about a dozen guys before they needed to head back to campus for a pep rally, where Don-Don (Thomas) got to talk for the team. After the rally Trevor and Sarah came by the RV for awhile. Trev had a second round of food and then we all called it an early evening, knowing that Saturday was a big day for everyone. It was a big day for Ken and I because Quincy Notre Dame football was coming to the game bring 80 team members, coaches and chaperones. 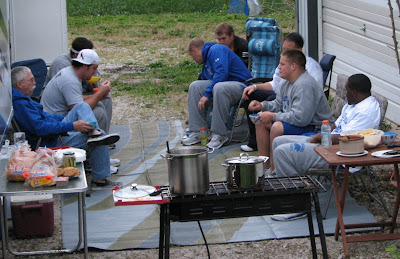 The EIU Panther were great hosts for the team. They provided tickets, a special area close to the stadium for parking, and even cordoned off an area for us where they set up tables and chairs, with electric hookup for our food containers. We went through 180 pork burgers and brats, with chips, cookies and lemonade. 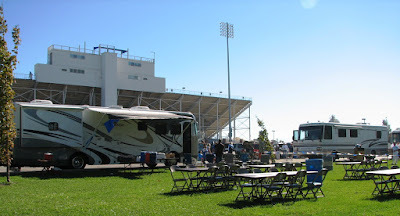 They picked a good day for their visit to EIU since there were a lot of tailgaters joining them . 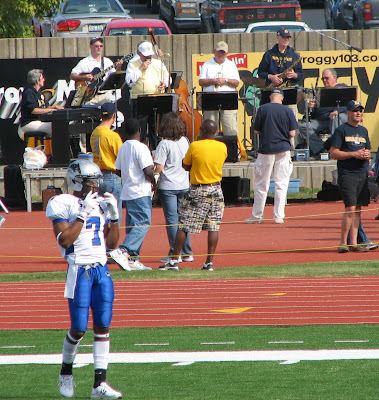 The QND football team were a line of gold across the stands. 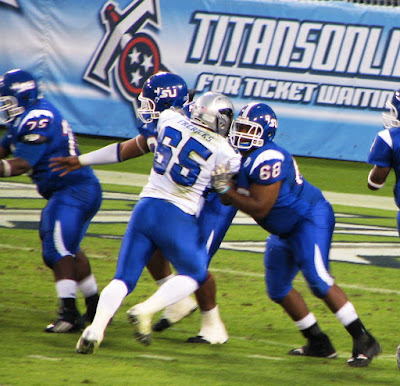 Unfortunately, they had to leave in 3rd quarter, just before Trev made a great sack, and the Panthers turned the game around with a come-back victory against Tennessee-Martin. 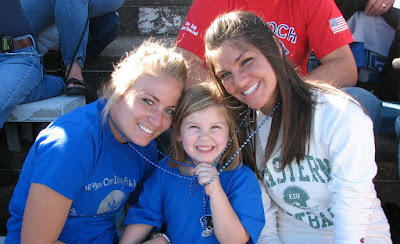 During the game, Trev's friends, Sarah Liesen, left, and Dani Flynn, right, made quick 'girlfriends' with Trent Steckel's little niece. Trent, one of Trev's housemates, ran in a 2-point conversion to give her even more to cheer about. Trevor's cousin, BJ Jacobsen, joined us at the game and for this photo op after. After the game we took our time cleaning up while Trev showered. He was having problems with the car and so we were chaufering him. I dropped him at Sarah's while Ken took 'Baby' out to Fox Ridge State Park where were planned to spend Saturday night. By the time I got to Fox Ridge Ken was had Baby settled in to site 12, one of our two favorites. We were glad we'd made reservations since for the first time, the hosts had the 'campground full' sign out. Since it had been a really big day we decided to go out to eat. We dropped back by Sarah's to check on Trev. It was obvious the post-game celebration was gearing up fast. Ken and I decided we probably weren't up to this level of college night life and opted out for a quiet dinner, just the two of us, at a local restaurant. We were back to the RV by 9am and took a nice long walk around the campground. It was perfect autumn camping weather, comfortably cool, breezy, with nearly every campsite replete with couples or families with kids enjoying campfires under a clear moonlit sky. Sunday we slept in and took our time with showers and breakfast before heading back to Trevor's house to work on his car. As it turned out Ken was able to start the car without problems and we drove it in to town for lunch without having any further starting problems. The wind was absolutely brutal with up to 45mph gusts. We got as far as Mt. Zion, about 45 minutes, and decided to pull over and wait for awhile. As it stands right now, we won't be taking 'Baby' for another outing for 3 whole weeks, since we have a game in Tennessee next week, followed by a 'bye' week, followed by a game in Alabama. We decided with fuel prices as they are it makes more sense to drive the Audi and do hotels for the next two games. We are not looking forward to going back to sleeping in hotels again! 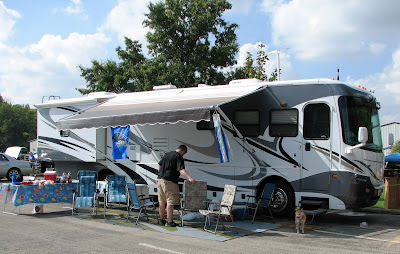 Being a newbie to RVing and after using Babe for a few months I learned that there are certain items that need more attention than others. While I was periodically checking the tires, oil, and other obvious things a somewhat mechanically inclined person would check, I was missing some items that need at least monthly attention. I had failed to check the coach batteries and so the first time that I checked them (four months after purchase) they were of course lower than they should be. Oh and they are a pain to check. The first few times that I checked them I removed them because there was not room to see the acid level much less add water if needed. Since then I have purchased a mechanics mirror (similar to a dentist mirror only it has a flexible head) and use it with a flash light to check the acid levels. It is hard to be precise this way but I can see well enough to know if I need to add water. Yesterday, when I checked the batteries I noticed some corrosion starting around one of the terminals and on the shelf the batteries sit on, so I decided to take the batteries out and clean things up. It was a good decion because as I was removing the batteries I bumped the angle iron that is there to hold the batteries in place and it moved. One of the screws that held the bracket in place was broken. It was an easy fix, I just backed the screw head out then used vise grips to turn the threaded end out of the hole and replaced the screw with a stainless steel screw. I know God watches over fools like me for what would have happened if those batteries began slidding around in that compartment? Other things on my monthly check list? Engine: oil, coolant, drain fuel/water separator, check air cleaner/restrictor, look at belt, and check for leaks. Transmission: fluid level. Generator: run under full load, oil, and coolant. General: batteries, tire pressure, bleed air tanks, washer fluid, AC filter washed. While I do these things I try to spot any thing that does not look right. 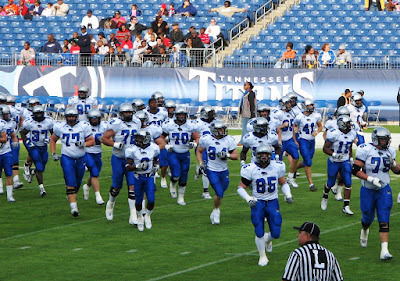 As you know from our blog we go to all of Trevor's football games. 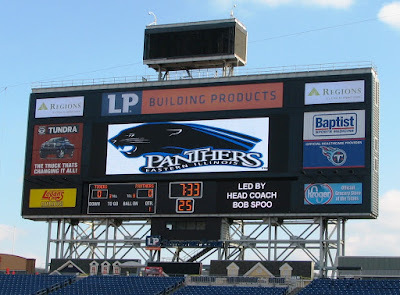 The home games are televised in HD on the local channel. At one of these games we asked Kyle to bring his small flat screen tv so we could watch the pregame, half time and post game shows. It did not work...all we got was static. Today I traced down the problem (hopfully) to a splitter that was miswired not allowing signal to get to the outside jack. Now all we have to do is test it. Lately I've been researching water filters as I plan to replace ours soon. There are a lot of different opinions out there about what is best and how to use it. Right now I leaning toward a Hydro Life filter system. When I fill the tank from home I will not filter the water allowing the chlorine in the water to help kill bacteria that might be in the tank. On the road, I plan to use a Hydro Life HL-180 in line filter. I discovered the Hydro Life filters while searching for a replacement filter for under the sink. Hydro Life uses a filtering systems that I read about on other web sites. It is priced in the mid 30's (a little higher than other brands) and scews in between two hoses making it compact and easy to use. This is my first addition to our blog site, so please send your comments. In particular, I would like to know if any of you have helpful comments on my maintence list or water filtering. 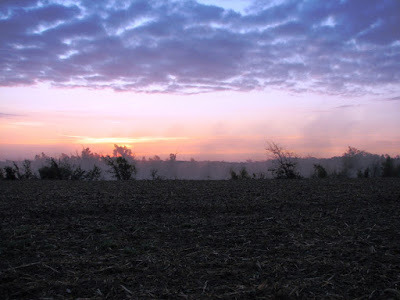 I thought I'd start this blog from out first morning on the road with a picture of the sun coming up over the fields in Litchfield, IL. It worked out quite well. 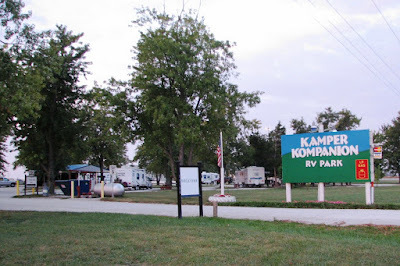 We arrived at the Kamper Kompanion RV Park on I-55, at Litchfield, IL. around 6:30pm. 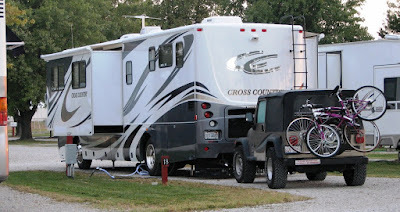 This RV park is perfect for what we wanted. $18 per night, full hookup...just off the interstate...very easy in and out...very safe location. Ken was able to pull in to pull-thru site 18 and keep jeep hooked to baby so we had very little to do in setting up or tearing down. I did my Nordic track, and we cooked sausage, black beans and rice with french bread. After walking the dogs around our one-night neighborhood we called it an early evening. Friday morning we took our time, cooking breakfast in the rig and were then on the road by about 9am. 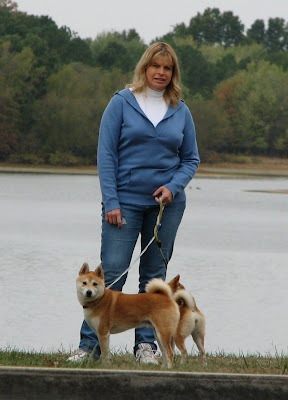 We took a break at the Rend Lake rest area where we took a nice long break walking the dogs along the lake and then warming up some soup for lunch before we headed back out onto I-57. We arrived at Ken-Lake Resort Park at about 2:30pm. We had definite concerns as soon as we drove the park. This is definitely not a place for large rigs. 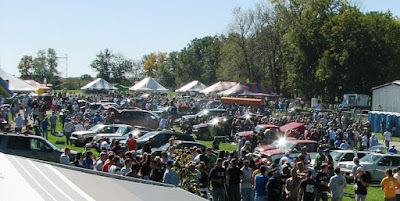 When we had called they'd told us that the sites were small but not a problem since it was ok to park on the grass. As it turns out we picked out a site near the entrance where we parked nearly perpendicular to the pad. It was also lucky that Ken brought plenty of water hose and electrical cord since the water (you see far to the right of picture and the electrical hookup was far down the hill to the left in this picture. 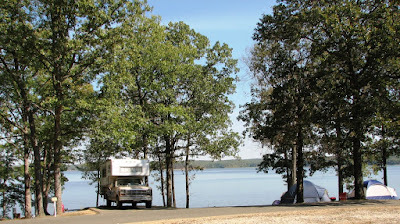 We took a walk around the campground and down to Kentucky Lake. 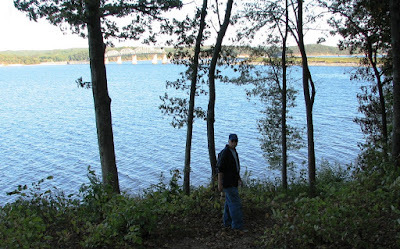 The bridge behind Ken in this picture takes you over to Land Between the Lakes. It was absolutely perfect camping weather and so we decided to cook over the campfire. 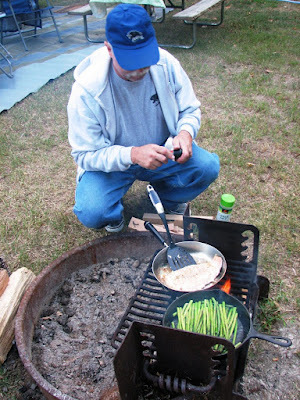 Ken did Salmon in garlic and olive oil, and sauteed asparagus over the open fire. I cooked baked potatoes in the microwave and in under 1/2 hour we had quite a feast. We pulled out the campfire coffeepot and filled it with decaf teabags and water and enjoy several nice hot cups of tea under of sky full of stars. After taking the dogs for one round about the campground, we snuggled down for a long cool night's sleep. Ken has bought a ceramic heater, so with the low for Friday night forecast for 40 degrees, we set this up. Sox caught on quickly and perched herself on the bed right in front of the heater. At 3am I woke up and felt a bit chilled. I realized the ceramic heater wasn't working and so turned on the RV furnace. The next morning when I tood the dogs out, I found that the breaker had flipped at the pole outside. Ken checked it out and determined they had the 20 amp service attached to the 30 amp outlet...not good! Luckily there was no one at the neighboring site so we were able to hook in to the the other 30amp outlet which appeared to be wired properly. Ken notified the park maintenance who came over to take a look and will be fixing this hazard before the next campers hook up at this site. I did my Nordic Track while Ken and the dogs enjoyed a leisurely stroll and meeting other neighbors. Knowing we had to do the full trip back in one day instead of two, Ken and I talked through Saturday morning, how to make the most of our Sunday drive. We agreed that we wanted to leave early in the morning but didn't want to wake the entire campground by using the centrally located dump site there. So, I spent some time figuring on the computer figuring out where to stop on our way back that we could dump. Sox thought this was a good time to sack out in her favorite naping spot on my lap. You'll notice that cord coming down by Sox' paw that is hooked to the air card on the side of my laptop. This is the attachment to the Wilson antenae booster Ken installed a few weeks back. It allowed me to have 5 bar signal on the Sprint air card the entire weekend. We took another long hike about the park. We found one site, site#20, that is reservable and has this lovely view out onto the lake. It would hold a big rig. I through together chef salad's for lunch and then headed out in the jeep to Murray, about 15 miles from the state park. 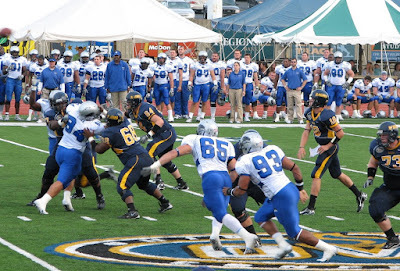 It was Murray State University Homecoming so there was a lot going on around campus. The team warmed up to the sounds of a Kentucky Bluegrass band! 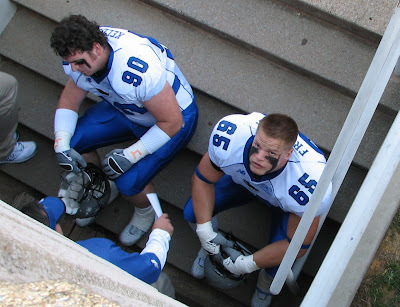 Since our seats were right above the locker room, I got this show of Tim and Trev 'meditating' on the staircase before heading out to the field. Murray State has a really great band that plays throughout the game. Much better than the canned music at most other stadiums. They also have half of the field surronded by a 'Tent City' of tailgators. Once again the game was much closer than it should have been. Here's a few action shots from the game. 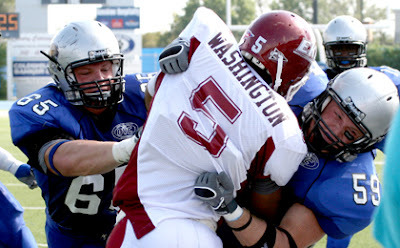 Trevor is #65. 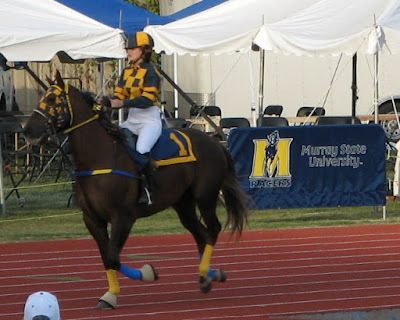 Murray State's mascot, Racer, gallops around the track every time their team makes a touchdown. Although he was a really gorgeous horse, I'm glad we didn't see too much of him with the Panther's winning the game with a final of 27 to 24. 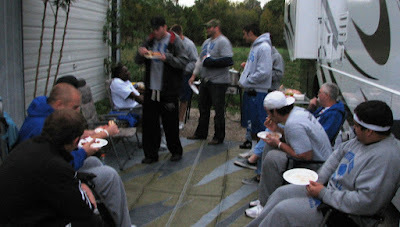 After spending a little time talking to Trev and the guys after the game, we stopped in at Martha's Restaurant for barbeque and then went back to KenLake State Park. We hooked up the jeep and did our preparation for getting on the road on Saturday night so that on Sunday morning we could get up and be on the raod by 7am. It worked out well, with the Love's truck stop a good stop 130 miles in to the return trip. We made our usual 50 mph average, at 10mpg, pulling into Quincy just before 3pm. 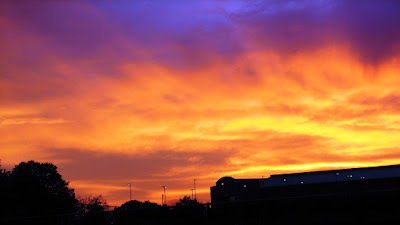 So until next weekend, I leave you with a beautiful sunset over Murray State University, after another beautiful weekend of RVing! We had originally thought that this would be a good weekend to take people from Quincy over and back the same day to see an EIU game. As it turns out we didn't have much interest from folks wanting to get up at 6am and spend 8-plus hours on the road for a game. With limited interest, Ken suggested we cancel that idea since he was beginning to get 'cold feet' about being able to handle doing all that in one day himself. 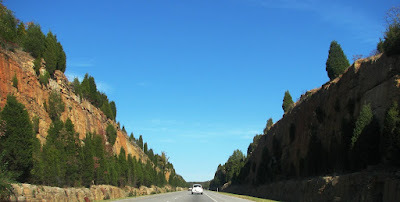 He was concerned we'd get to Charleston, he'd get sick from too long a day, and we'd be stranded with only me (who has never driven over an hour or at night) as the only RV driver. As it turns out, it was a very good idea that we didn't do a one-day turnaround trip. It was in the 90's, and with all the heat and activity, Ken was totally exhausted before the game was ever over. One really great thing did come of our aborted plans. 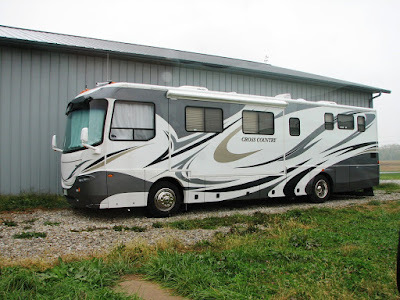 My friend, Cheryl Ift, decided that she'd still like to go even if it meant spending 2 nights with Ken and me in the RV. Having Cheryl along turned out to be a wonderful change of pace, although Ken commented that I talked more on that trip with Cheryl than he thinks I've talked in the entire 6 months of trips previously! Something about the 'old hens can't seem to stop cackling'... was closer to the way he put it! Cheryl got the full RVer's treatment since we stayed at Trevor's house without any hookups beyond 110 electricity. That meant that the 3 of us had to ration water and time our use of air conditioning, microwave and blow dryers to when we were running the generator. Luckily while the days were scorching, the night's cooled off nicely and we were able to sleep with window open and a breeze provided with the help of our dual Fantastic fans. We insisted that Cheryl take the bedroom so I got my first experience of sleeping on the dinette-made-out-to-bed while Ken slept on the couch. We could have made out the sofa sleeper but this way it is easier for us to move around without the sleeper sofa taking up so much room. We have discussed that we will probably someday replace the sofa sleeper with a jack-knife sofa so that it doesn't take up so much room on the rare occasions when we need to use it for a bed for a night or two. Kyle and Luke drove down from DeKalb late Friday night to join us and sacked out in Trevor's basement. Ken fixed everyone his class 'big breakfast' of sausage, eggs, fried potatoes, toast, coffee and juice each morning. For the first time in 6 month's I've had to decline. It seems that while these month's since we've gotten the RV have been some of our best together ever, Ken and my eating habits, and I believe particularly his 'big breakfasts' have played havoc on my once healthy cholesterol numbers. It just so happens that in these past six months while my HDL and Triglycerides remain in good shape, my LDL (the bad lipids) number has jumped a whopping 44 points. So needless to say, besides foregoing Ken's great morning cooking, I'm also now back on my Nordic Track regime. Saturday morning we arrived at the stadium parking lot at 10:00am where we were greeted by John Smith, Associate Athletic Director, who had a spot reserved for 'Baby'. 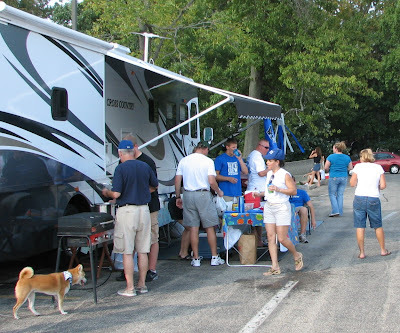 The staff at EIU is always very helpful and he told us he would also have tables and chairs set up for us when the 75 QND football players come to tailgate with us on Oct. 20th. Here's Kyle setting up outside. Luke manned the grill to get onions sauteed for the brats. 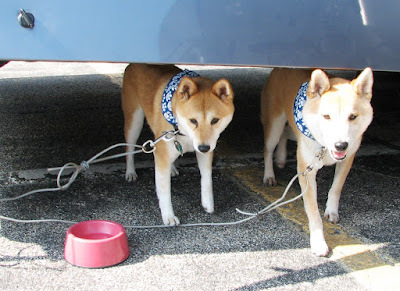 Sox and Ditka, in their official EIU panther outfits, decided that it was too hot to be sociable and hid out under the RV where it was cooler. We got inside this time for kickoff and saw a close game. 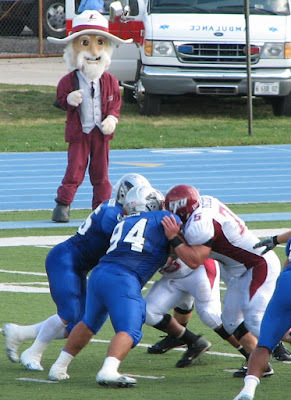 Here's Trev and Andre going head-on with the Eastern Kentucky defense as the Kentucky Colonel looks on. Trevor and Pug (59) sharing a tackle. Here's Cheryl and Andre's Mom taking a half-time break back at the RV. Unfortunately, the game ended up with us behind by a touchdown. We had a lot of lost opportunities on our side such as not scoring twice when we twice had first-and-10 inside the 5 yard line and didn't score. 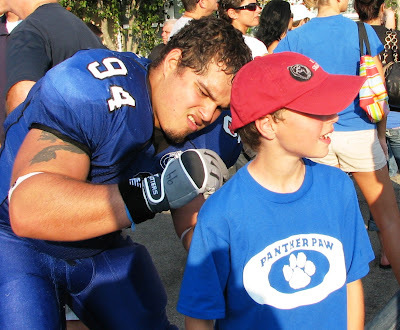 The losing score didn't deter young Panther fans from tracking down Andre for his autograph. 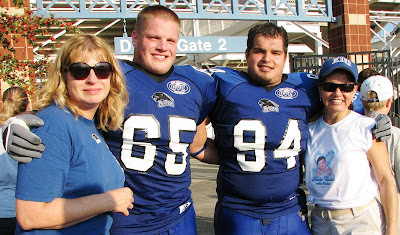 ...and Ken snapped this shot our Trevor, Andre and mom's after the game. There was one definite lesson learned on this day. We were totally exhausted by the time we got packed up and back to Trev's house. The idea of doing 4 hours to the stadium, tailgating, and driving 4 hours back all in one day--- that ain't gonna happen. 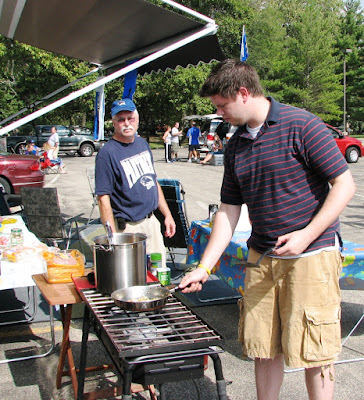 With the loss, none of the players were in a particularly festive mood, so we parents picked up items to do on the grill and fed the guys at home. Larson's used our grill for steaks, while we did pork loin, and yet another group had spaghetti going in the house. Everybody shared food and had a nice meal together. We did have one minor mishap. We left the food sitting on the table while we went inside for awhile and it happened to be at the same time that someone left Drew's dog Rosco out for a run. Rosco being the disriminating sort, found the plate of remaining steaks and made short work of them, while leaving all of the other food untouched. Luckily the pork loin was out of his reach. But then that leftover meet didn't last long either since when Ken went up to the guys rec room to play some beer pong, he took the remaining meat, coming back an hour later with only the empty plate. Kyle and Luke decided the loss had dulled the Charleston party scene and decided to head back to DeKalb. However, Jenna Brink, arrived from Quincy shortly after so Trev's fan base wasn't considerably diminished for the evening. 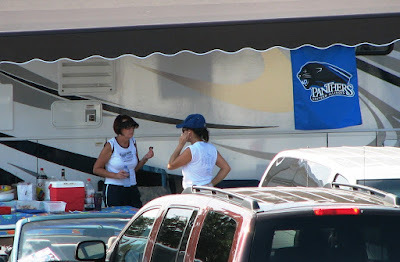 Cheryl and I decided to forego the beer bong tournaments and sat around the RV doing what we do best - talking. The full day of heat and activities had us all done in before midnight. Sunday morning, Cheryl and I drove in to Walgreen's to get a prescription filled for Trevor while Ken started packing up. Jenna and Trev joined Ken, Cheryl and I for another of Ken's 'big breakfasts'. I stuck with whole wheat toast.Trev had to be back in to the stadium by noon so shortly before that we headed out with Jenna following until we got to I-72 to make sure she found all the smalltown turns. This was probably the first time we'd driven for any distance with an almost full gray water tank and we noticed that it was giving off a smell. Closing the drain covers in the sink seemed to resolve that but convinced Ken to do some major tank flushing this week before the next trip. We altered our route home slightly to go past Siloam Springs State Park so that we could dump tanks. This worked out really well and didn't seem to add time to the trip. 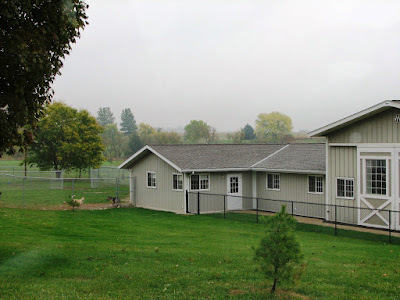 When we got home, the dogs said their good-byes to their new 'best bud' Cheryl and I took her home in the convertible since her small subdivision street would have been a bit much for 'Baby' to negotiate. Ken and I were unloaded in record time and I was even able to get in a session on the Nordic Track before calling it a day. 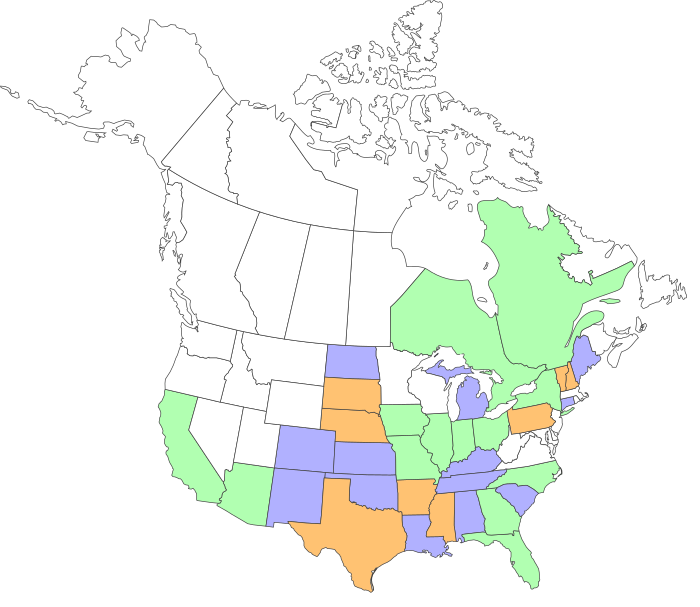 Stay tuned...next weekend is our longest trip ever...and 'Baby' gets to mark off a new state as we travel to Murray State in Kentuckly.